Shaykh Abdul Nasir Jangda is the founder and director of Qalam Institute. He was born and raised in the Dallas area. He is a founding member and chairman of Mansfield Islamic Center. Sh. Abdul Nasir is also an instructor with Bayyinah Institute, where his class “Meaningful Prayer” has traveled the country. 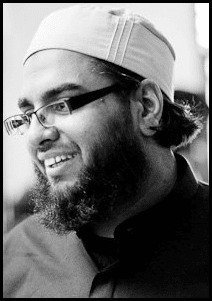 His latest projects include Quran Intensive (a summer program focusing on Arabic grammar and Tafsir), Quranic analysis lectures, Khateeb Training, Happiness in the Home, The Good Life, and chronicling of the Prophetic Biography at www.qalaminstitute.org. I had the honour of interviewing Sh. Abdul Nasir Jangda. His latest project called “Happiness in the Home Project” focuses on how a person can engage with his/her family in the most productive way. Listen to the interview as Sh. Abdul Nasir explains how a person can be productive with their families during Ramadan. You can also read the transcript below. And welcome to another interview with a truly productive Muslim. Today we have the honor of interviewing Shaykh Abdul Nasir Jangda, He’s the Founder and Director of Qalam Institute and he’s an instructor with Bayyinah Institute. His latest projects include Qur’an Intensive project and Happiness in the Home project as well as speaker training. You could find more about Shaykh Abdul Nasir and his programs at qalaminstitute.org. So, today’s interview will focus largely on how a person can be productive with his family during Ramadan inshaAllah so listen in. Sh. Abdul Nasir: Wa ‘alaikum-us-salaam warahmatullahi wabarakatuhu. Alhamdulillah, I’m doing very very well. I apologize for my voice being out a little bit because we just actually got done with Qur’an Intensive so one of the side effects of Qur’an Intensive is that I lose my voice. Abu Productive: Alhamdulillah, inshaAllah, you’ll be fine. Shaykh Abdul Nasir, Today’s interview is about asking you about productivity with the family during Ramadan, I know this is a bit limiting or you’ll find it being a bit more focused. But people say well, when people think about Ramadan, they normally think about their personal worship or ‘ibadah, but how can people become productive and with their families during Ramadan? Sh. Abdul Nasir: You know one thing that’s very interesting you mentioned in the introduction about the Happiness in the Home project. There’s a lot of different things that come in to bringing and increasing the happiness within our homes. One of my specific focuses in terms of this project and this topic here today as well, ‘how to be more productive with our families in the month of Ramadan, one of my efforts, one of my areas of focus is to highlight the area where spirituality intercepts with family life. Too often, for whatever the reason is, I think there are different socio-economic factors, cultural dynamics, but for quiet sometime, the last couple of generations, there’s been this impression that spirituality comes at the cost of family or that family life comes at the cost of spirituality and so one of our focuses is to highlight where these two intersect with one another and how a person can thrive in both of these areas at the same time. So you talk about focusing in, I think focus is always a beautiful thing because it allows you to really understand what you’re talking about, and then I think that’s part of what makes Productive Muslim such a remarkable project, and such a remarkable initiative that there’s so much focus in the program. But you know Ramadan, like you said, it’s a time when people typically focus in on individual worship. What I try to explain to folks is that we go back and we study the Qur’an, we study the life of the Prophet , what we end up realizing is that the Qur’an and the Prophet made a very very specific effort to emphasize the fact that family life is an ‘ibadah (worship), family life is a part of the spiritual experience of a Muslim not the hardness of it and that’s I think one thing that’s very important. So I often times, in my lectures, in my programs, what I try to explain to people is that sitting down and having an intimate dinner with your wife and having a long conversation with your wife – that is an act of worship, aside of course from the required worship, like the five daily prayers but aside from that, that’s an act of worship in itself. You know, playing with your kids, running around with your children is an act of worship. That’s something I think if people were to focus on, I think things will start to make a lot more sense till we realize how Ramadan is actually an opportunity to improve our family lives and our family experience. Abu Productive: Shaykh Abdul Nasir, you mentioned the concept about spirituality and family life being connected; can you bring more examples, more concrete examples to the young modern reader? Sh. Abdul Nasir: Absolutely I’d love to. You know we were conducting the tafseer (interpretation) of Surah Taha in the Qur’an Intensive tafseer sessions and that at the end of Surah Taha, Allah says: “Wa’mur ahlaka bissalati wastabir ‘alayha” (And enjoin prayer upon your family [and people] and be steadfast therein.) [Qur’an: Chapter 20, Verse 132] One of the very interesting underlying themes of Surah Taha is that Surah Taha is emotionally consoling and comforting the Prophet Muhammad . In the middle of the Makkah era, when there was aggression, oppression and violence started to increase and intensify, at that time Allah comforted and consoled the Prophet p by means of Surah Taha. And so one of the tools that Allah gives to the Prophet is lean on prayer; at the beginning of the Surah when Allah tells Musa that he has to go and preach to Pharaoh and he prepares him to go and deliver the message to Pharaoh which is extremely challenge him. He tells him “lean on prayer” and we understand that as Allah also says “seek help from Allah through patience and prayer” so we understand that but what is very fascinating is at the end of the surah, in the conclusion of the surah, Allah doesn’t just tell the Prophet to lean on prayer, but to tell your family to pray but you also be regular and punctual about the prayer and to emphasis that don’t forget about that fact that your family can be a source of strength with you. Leaning on prayer to derive and continue to motivate himself and to find a source of energy and strength in the fulfillment of his task on his prophetic mission. Allah tells him to pray and he himself also, what other better way to seek our motivation and energy and to find peace and tranquility amidst all the turmoil in the fulfillment of the prophetic message and mission than not to only pray and strengthen your connection with Allah , but to do so along with the family. Now when we go into the life of the Prophet we seek more concrete examples of this. We see the Prophet used to offer the five times obligatory prayers in the masjid in congregation but it was also part of the prophetic practice that he would go back home to offer all of his sunnah and nawafel prayer. So as to say that, pray together with the family. That’s why he made dua (prayer) that mercy will be showered on the man that wake up in the night to and wakes his wife to pray with him, or the wife that wakes in the night and wakes her husband to pray with her. The Prophet of Allah in the battle of hudaibiyah, so now you have the religious, the prophetic, but at the same time the political strategic state affairs that the Prophet also shouldered the responsibility, that in the treaty of Hudaibiyah, when the treaty didn’t go as how the Sahabah (Companions) would have expected or hoped he was trying to get them to pack their things and head back to Medinah, they were slow to react because they were so dazed and confused that the Prophet went and told his wife, Um Salemeh, and she imparted on him advice. So we see that on in each and every single turm, there are narrations of the Prophet giving the khutbah (sermon) and his grandson Al-Hassan runs up to him and the Prophet would pause the khutbah and coming down, scooping up his dress and hugging him and kissing him and introducing him to the congregation and then going up to the minbar to continue his khutbah. So we see that the Prophet made a very very open effort to demonstrate how spirituality and family intercept one another and how they are not exclusive of one another. Abu Productive: Shaykh Abdul Nasir, we are assuming here that the whole family are on the same spiritual level. A lot of times I get questions especially from young guys saying that my parents are not religious in fact they discourage me from becoming spiritual, or my wife isn’t spiritual, or my children are not very religious. So what advice do you give to each of these groups where people say like parents or wife or my children who are not on the same spiritual level so that I can do these together like have that perfect family that we hope to have each day? Sh. Abdul Nasir: That’s a very good relevant, pressing question and situation that’s in our communities and what I’ll explain about that is that the scholars say that amongst the companions of the Prophet , one of the most remarkable individuals was Abu Bakr. But what was interesting is that one of the fad’el (virtues) and blessing that Allah showered upon him is that his entire family accepted and embraced Islam and what scholars say is that we cannot separate from that fact is that the Prophet’s graceful and merciful nature and the merciful behavior, his hilm, patience and forbearing of Abu Bakr and that cannot be separated from the fact that the entire family, even his very elderly father, who when he came to accept Islam, he was blind and his hair had gone white so much so that even his smallest stripes, even his eye brows and eyelashes were white, at such an old age he accepted Islam and on the hands of the Prophet . So the patience, merciful nature, the forbearance of Abu Bakr proved this. What I would also tell the young people who are in more difficult situations need to understand that we have a principle in our religion that ‘the rewards of our deeds are according to the level of efforts and sacrifice that go into it’ – it would be extremely convenient and very easy if the entire family was on board and motivated and in fact ahead of that person in spiritually. It might be a little more challenging if you feel like your family are lacking behind you, but if you could (and I’m going to say this and it’s a little shocking to young people since they have more enthusiasm and energy, maybe more than they have foresight) if you were to slow your pace a little bit so you can get a hold of your family and bring them along with you, if you were the engine that brings them forward, the blessings of this life and hereafter will be far superior than anything that you can achieve individually. Abu Productive: Would you say that sometimes it’s a lack of patience and to see things in the long term, sometimes your family love you and even though they are not on the same spiritual level but they love you and care about you, they don’t try to pull you down, they just see the change in you and seem a little worried, they may see that the change they have to make, so you don’t always have to think of it as a negative, as if you are trying to fight them and say ‘oh, they don’t understand me and this is really difficult’. So how do we inspire patience and say hey guys take it easy and look at them with mercy and forbearance and be mature about this? Sh. Abdul Nasir: Absolutely, I mean it goes without saying. A lot of times it’s a loss of perspective. You know, a reality of life is that you never know what it’s like to be a parent until you become a parent, but what I do try and remind young people is to try and see thing from their eyes because at the end of the day, a parent loves – you know I often explain to people that there is a hadith in Sahih Muslim where the Prophet psaw] when he wanted to draw some type of parallel, to give us some type of understanding of how much Allah loves us and how much mercy Allah has for us, the Prophet compared the love and mercy that Allah has for us with the love and mercy that a mother has for her child. I mean just think about that that was the only example that the Prophet thinks of to demonstrate how profound Allah’s love and mercy that He has for us. That’s how much a mother or a parent loves their child. So try to understand they love you. One of the relevant lessons from surah Taha that we covered was the Qur’anic supplication, “Oh, Allah increase me through knowledge”, instead of how its commonly translated, “Oh Allah increase my Knowledge”, meaning the purpose of knowing more and learning more is to become a better person. If you want to truly demonstrate to you family that spirituality, knowledge or whatever you are doing is good for you and making you a better person, you have to demonstrate it to them in a manner/fashion that translates to them in a manner that they can see and understand tangibly. And this happened primarily through our character, mercy and the love we express to them. If you become a more loving son or a more loving daughter, a more caring child then that will demonstrate to them how much you are improving as a person, more than you spending eight hours a day reading the book – which is great but it comes back to being a productive Muslim, being able to implement what you want you are learning in all areas of life so that the benefit of that can manifest in all our areas of our life. Abu Productive: Shaykh Abdul Nasir now we are going to go into Ramadan and see a person balances between family, spirituality or how to bring these two together. So I’ll take you from a different perspective. So let’s take that of a husband, he wants to go all out, pray taraweeh, I’tiqaf, but he has young children, his wife at home, how would you advise him to bring family spirituality back in Ramadan and be productive with his family during Ramadan? Sh. Abdul Nasir: The first and foremost thing, and I think that ProductiveMuslim does an amazing job at this, it is about managing your time properly. Scheduling is very important, the more you’re aware, the more you can schedule and manage your time, and there is a time for everything. The scheduling is essential and is key, should be a balance between the small things such as suhoor and iftar. You know there was a study that was done in 2006 by the Center for Substance Abuse and Addiction at Colombia University that was published in the Times magazine and the storyline is people having a one-time family meal together will be healthier, happier, there is blessings in something simple as having a meal together. There is a lot to be said about that. So suhoor was scheduled and the family would cook suhoor together and ate suhoor together, this is a phenomenal bonding experience. The same as iftar as well, I recommend you spend the time to prepare together and you sit down and eat together and you clean together. Spending 2 hours or more in the day together is very productive, quality family time. I recommend the salah, or Fajr, Asr and Isha and split your Qur’an recitation time. Set a time, so if you have an hour or so a day for Qur’an, set 10 minutes aside for your family. Read a verse, translate that verse and talk about what you learned from that verse as a family together. These small things are important and when spirituality isn’t sacrificed. It is a remarkable opportunity to come together and bond together and doesn’t compromise on Ramadan and the spiritual journey of the individual. The other thing I want to say, who people are very family oriented, and may not be a very popular thing to say but I feel is a very necessary thing to say is when we talk a lot about our families and not understanding what our goals and ambitions religiously. This comes from a very particular place as some people don’t have the opportunity to grow themselves spiritually and enhance a bigger gap and a bigger gap is created between the family members. If the husband is going to the masjid 4 or 5 times a day or 2 or 3 times a day then the month of Ramadan for taraweeh prayers, the tafseer lectures every single night. He’s in the masjid continuously, at night times and the wife is at home managing the home he shouldn’t be shocked to know why his wife doesn’t understand where he’s trying to go with the deen for the sake of the family, spiritually. He shouldn’t be shocked as he is receiving what the wife isn’t receiving. We’re human beings, we’re products of our personal experiences and circumstances. What I recommend for family to do is at equal trade-off, so at least at some level at least once or twice a week if not every other time of the week it alternates the opportunities. You know here in the United States, we have spaces in the masjid for sisters and there is a very good sister experience in the masjid as well. So I’ve always recommended that give to people, to give your wife the opportunity every time of the week, where you’ll stay home and you’ll take care of the kids and she will go to the masjid to pray, to listen to a lecture, to be able to participate spiritually in the communal activities and for people to benefit and grow and I say this is controversial because fiqh wise there is a difference, because there is a sunnah mukadah and the opinion of the many scholars and they’re meant to go for the taraweeh prayers and because it’s not for the women but rulings are in fact technicalities. They are the bottom line as to what to discuss. But then there’s the issue of fatwa and the issue of taqwa and building families and building communities and we need to take a much more spiritually intelligent focused approach to be able to achieve our goals. Abu Productive: You just bought up the perfect point on sisters, a lot of sisters and mothers email me and ask how can I be productive in Ramadan. Need to take care of the kids, the home. So what is my advice to them to be productive and be spiritual at the same time? Sh. Abdul Nasir: I’ll give you the advice with the disclaimer that I have an utmost respect for our sisters in our communities, especially the mothers, being a mother probably is the most difficult job in the world. You know I teach a seminar in khushu’ in salah or prayers, and after going round and giving these seminars I realise the most eye opener is maybe working professionals have the hardest times, praying and making sure they have khushu’ in their prayer. But I realized no, mothers of our time, mothers of our young children have the most difficult time implementing khushu’ because they have a 4 year old and a 2 year old. I can tell you about my 4 year old and 2 year old. If you take your eyes off them for 2 minutes, you will find one scaling the walls, the other one will be on top of the house. Yeah I’m telling you, kids can be resourceful. Mothers have the most difficult job in the world. So I can’t even claim to know how that would be like but based on talking to my own mother, speaking to my sister who has a young daughter, speaking to my wife who has 2 babies, what I recommend is going back to scheduling and trying to find time during the down time. Kids usually have a down time, where you would want the time to catch up with recitation or prayers, some memorisation, some supplication. This is the opportunity to catch up and the other thing is women are very strong. And I recommend the sisters to be vocal, to not be afraid or ashamed, ask for family help or the husband. The parents or siblings. Not to be embarrassed to ask for help, so complete the washing up so I get some recitation done. I need you to sit down and watch them for an hour while I catch up on my prayers and this goes down back to our topic that family is very important in the spiritual experience. Abu Productive: Alhamdulillah. For the family, now moving to the community and this is part of our quest of being socially productive, again come out of your closet, your personal ibadah and being engaged in social activity and being productive. Your neighbours for example, your community in your locality and if you can say: the Ummah at large. So being socially productive and having family to support this. What are some advise/tips/techniques/maybe stories you have in this regard? Sh. Abdul Nasir: You know these issues and matters forms a lot of comments, but we naturally have a lot of commonsense. If we were just to utilise our commonsense, our opportunities are around in every corner. You know, if you were to have iftar with your family then just have iftar with a group of families and try and network with a group of families. I can speak about an American experience, we have Masha Allah a worldwide audience, but a lot of times people turn to the masjid for a social opportunity like having iftar in the masjid and that is very good and I encourage that, but don’t overdo that. Getting families together across the board, across the spectrum, reaching across the spectrum and ethnic lines and to come together to bring food together, it is a great opportunity to bond together as a community. Another great opportunity is I’m speaking about the United States and a minority community and we have a large community of a Muslim population living around us. You want Ramadan to be a time to reach out to them. You know taking some sweets, taking some food. Some gifts to your neighbour’s house, saying it’s the month of Ramadan. It’s the occasion of Eid, trying to share this occasion with them. This is an awesome opportunity. I have a really interesting story. When I was a full-time imam of a masjid in the area we kind of put an effort to send out some letters to the neighbouring faith-based communities and neighbouring centres. Social organisations were in the area, we sent them requests to come and break their fasts with us in the month of Ramadan and quite a few people did make it, and this one gentleman came through and he said I want to bring my younger daughter with me who is, I think 6 or 7 years old. And he came and his daughter was running around with the Muslim kids and he said my motivation to come was that I wanted my daughter to meet other people and see people from other ends of the spectrum and subhan Allah that lead them to learning more and then eventually accepting Islam. And my dad, this is something we do since we were young,..both of our neighbours who live on either side of our house are non-Muslims. One is a Hispanic family and one is a Caucasian family. And my dad, whenever Eid or Ramadan or anything comes around he always takes something nice over to their house. And even when my sister got married I remember he invited them to my sister’s wedding. So these are really really good opportunities to be able to just reach across. We, at a lot of times, talk about this at our Fast for Thought.. at our Ramadan programmes. Fasting helps you understand how the other side lives. It helps you understand and empathise with the suffering of the people but we really have to make a more concerted effort not to just say that as a OR stunt but we actually have to do it. I really recommend, especially for more middle-class communities, organise events. Go to the homeless shelters and serve the needy while you yourself are fasting. It’s a perspective that a young person will never forget In sha Allah. Abu Productive: Jazakallahu Khayran. Now Ramadan is a great time to develop habits and we also have a tool to help people to develop habits where we ask people to try and stick to a habit for 30 days called ‘Don’t break the chain’. For each day you do the habit you place an X in your calendar and don’t break the chain. So what sorts of habits would you recommend to help people develop that? You know, be close to their families, to include family in their spirituality and to be productive with the family during Ramadan? Sh. Abdul Nasir: I really admire ProductiveMuslim for providing tangible tools to people to do this. Often times my pre-Ramadan, get ready for Ramadan khutbahs will sometimes focus on what is the opportunity of the month of Ramadan and what Ramadan means to us. One of the things I always recommend is that before you even leave the masjid today, as soon as you’re done with salah before you get in your car and you drive off, take out your phone take out a piece of paper and a pen and write down 3 good habits that you would like to develop during the month of Ramadan and write down 3 bad habits that you would like to give up and masha Allah ProductiveMuslim is providing tools for that. But you know it kind of goes back to that same thing in terms of number one scheduling. When a person schedule themselves they realise how much they’re actually capable of doing. So if you develope’ a habit with the family of having two meals per day with the family then don’t give that up. Have breakfast every day with your children, with parents, wife and then eat dinner together as a family. At the very least make it a habit that you will sit together and share a meal together every day. If you started a little mini home halaqa in the month of Ramadan where that one ayah discussion per day that I was talking about, don’t give that up when Ramadan is done. If you developed a habit during Ramadan of going to the masjid as a family, then don’t give that up. Once a week, Friday nights we go to the masjid. We often complain about the lack of activities in our masjid that cater to families. We have to understand one thing as well… yes, they should do their job and provide activities.. and believe me, folks in my division we put a lot of pressure on the community to provide those type of activities but at the same times if 45 families showed up on a Friday night, the masjid itself would have no choice but to provide an activity because otherwise they are going to have a riot on their hands. It’s just commonsense again. Communities are in charge of their masjid of their prayer spaces so take charge of your responsibilities. These habits that develop during Ramadan, keep them going. Write them down, use the tools ProductiveMuslim is providing and just keep the chain going and don’t break the chain. In the same way, I have to say because of the hadith of the Prophet somebody who doesn’t eat or drink but doesn’t give up their bad habits in the month of Ramadan while fasting, Allah has no need of that person to deprive himself of food and water. The objective of Ramadan is to give up bad habits, whether that be physically, verbally, spiritually, whatever the bad habit we have. The majority of them that the Prophet spoke about in terms of our character like back biting, lying, gossiping etc. So whatever bad habits you give up, write it down, focus on them during the month of Ramadan and when Ramadan is over keep reminding yourself. That’s why fasting is an institution in and of itself…the three white days in every month, the 13th, 14th and 15th of the lunar calendar, fasting Mondays and Thursdays. The reason why this needs to be a regular part of a Muslim’s life is so that once a week, twice a month we are getting a reminder of remember the lessons of the month of Ramadan, remember the blessings and the improvement and let’s keep that going the rest of the year so when the next Ramadan rolls around, we make a greater improvement on ourselves. Abu Productive: Final question. This question I always ask every person I interview.. How does Sheikh Abdul Nasir fight procrastination and laziness? Sh. Abdul Nasir: Fighting procrastination… I guess everyone has their own approach. Myself personally, I’ve always been someone who ..I learnt this habit from my mother actually.. I learnt to be my own harshest critic. I realise that can be a bit demoralising for people but I am my own harshest critic. I’m kind of what we call here in the States, “getting into my own head”.. I convince myself, talk to myself. I think deeply about what I’m doing and what I need to be doing and then I continue to push and motivate myself..but I do lean on family. When I sit down and reflect on my last week what I did, what am I procrastinating about,what am I putting off what am I being lazy about and I come to a conclusion about maybe two items that I’ve been putting off. I will actually sit down with my wife and say look, this is a problem for me and that is a problem for me and I need you to be my coach, stay on my case, call me out. And then I have to be willing to be not so sensitive to the point where she goes, oh no you’re doing it again.. then I’ll be like you’re right, you’re absolutely right, let me get back on my game. So it’s kind of a combination of introspection and reflection and checking yourself regularly. The famous advice of Umar ibn Khattab was self assessment and number 2, having someone that you love and trust and respect in your life that you can tell them I need you to catch me when I do this and In sha Allah they can pick up the slack. Abu Productive: That’s a brilliant one, I’ve actually never heard that one before so it’s a brilliant one about telling someone. Normally people think of their own tools but, as you said, you need to lean on your family they can be the biggest source of strength for you to help fight procrastination. Sheikh Abdul Nasir thank you very much for a very practical and very inspirational interview. Where can people find you and find your work In sha Allah? Sh. Abdul Nasir: Absolutely. In sha Allah they can find me and the majority of the work that I do at qalaminstitute.org. We make an effort to put up a lot of podcasting, a lot of beneficial content. I’m specifically working on a seerah project, an in depth life of the Prophet from classical sources in English extracting practical lessons. So In sha Allah they will find our podcasts and programmes there. Sh. Abdul Nasir: Ameen. Assalaamu alaikum.